Face to face with a key opinion leader of the Eye-care field in Mexico. Hasta la vista! Tell me a bit about your professional background. How long have you been in the ophthalmology field and why did you choose your specialty? I finished the ophthalmology specialty training in 1997 and immediately after, from 1997 to 1998 completed the subspecialty in Cataract and Anterior segment of the eye and since then I have dedicated myself to ophthalmology. I started working in Mexico City with colleagues in private practice and then I moved to Monterrey with my family since my husband is originally from Monterrey. He is also an ophthalmologist, subspecialized in Cornea and Refractive Surgery. I currently manage the Institute for the Prevention of Blindness in Nuevo León AC where we provide services for low-income patients; privately, I am the Medical Director of Ambulatory Surgery SC. 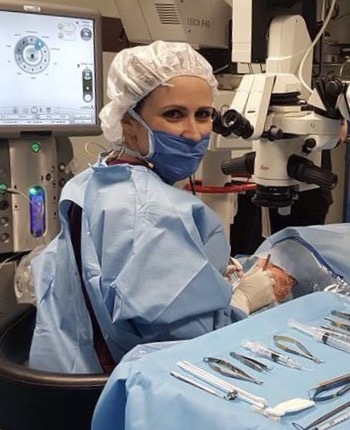 I chose this specialty because while studying medicine I enjoyed all aspects of eye care, also because it is a medical field where no other doctor could engage (if one is not specialized in ophthalmology is not be able to diagnose the different ophthalmological pathologies, much less perform an eye surgery). I love everything about the surgery and above all knowing that I am giving sight back to my patients. From your perspective, what is the biggest challenge for the Eye-care sector today, both in Mexico and globally? The greatest challenge is to combat blindness; with cataract being the main cause of reversible blindness in the world, we must promote support programs to be able to act opportunely to help the affected patients and to carry out prevention programs to reduce the incidence of visual impairment. Also, to raise awareness of eye health and the need for regular eyes checkup at least once a year. Carry out campaigns to emphasize cataract surgery, as well as glaucoma detection and diabetic retinopathy campaigns, these later two being the main causes of irreversible blindness. Myths and misconceptions: that the cataract is a stain in the eye, that cataracts affect only older adults, that cataracts recur even if removed surgically, that cataracts can be dissolved with drops, that cataracts may develop if we read a lot, sew, or watch TV for a long time, that cataract surgery entails risks and recovery is slow, that the intraocular lens maybe rejected, that the formation can be removed with laser eye surgery. What new research and products are available for cataracts in Mexico? Recommended preventive measures to avoid the aging of the crystalline lens, are to protect the eyes from UV light by using sunglasses and to increase the intake of omega-3, lutein, zeaxanthin, etc. In terms of surgical management, there is diversity in materials and equipment for surgery, different types of machines, viscoelastic materials, intraocular lenses, and pre and post surgical procedures. Cataract surgery is performed on day-hospital basis, it is a relatively fast surgical procedure to restore the sight or to correct vision problems, and to give the patient the options of the type of intraocular lens according to each patient needs. The patient must be reassured of the surgical technique and the low incidence of infection. What have been some of the most rewarding experiences you have had as a cataract specialist? I have had many rewarding experiences in all these years as an ophthalmologist, particularly performing cataract procedures. The most striking are those patients with hypermature or brunescent cataracts that have visual acuities of light perception that actually improve to 20/20 after the procedure, and return to the office crying, with great feelings of gratitude and blessings. We also keep track of pediatric patients (congenital cataract) so to see them grow with visual function that allows them to perform academically, psychologically and socially. Also cases of traumatic cataract surgeries that need urgent treatment that turn out well quickly with the restoration or preservation of the sight.